Arrival to Varna Airport. Transfer to the hotel. Time to relax on the beautiful sunny beach and enjoy the multiple entertainments. Possibility to visit nearby attractions or the town of ancient Nessebar, included to UNESCO list of World Heritage. Check out. Departure to the Airport. End of the program. Completely renovated for Summer 2013, this modern and comfortably furnished hotel has a perfect position right on the beach front, on the main promenade of the resort. The glorious sandy beach is some 20-25 m meters away, and is reachable by a series of steps. The price is in euro per person. 5 overnights in Kaliakra Palace, 4*, sharing standard double room. Food and drink not listed in the program. 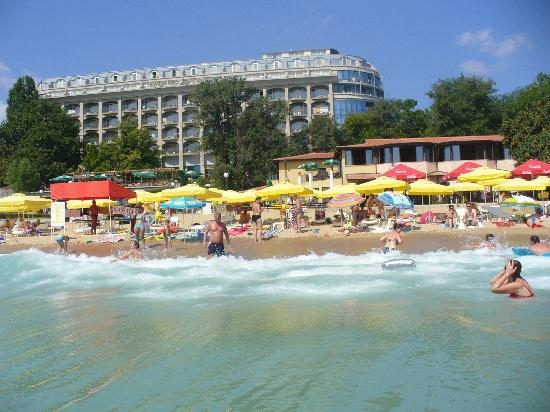 Zlatni Pyasatsi (Golden Sands) is situated at a distance of 17 km north from Varna city, in close proximity to the breezy forests of the natural park “Golden Sands”. The climate is exceptionally suitable for marine tourism with hot summers and average temperatures in the month of June of + 22° С. The presence of mineral springs with healing water had brought Golden Sands the fame of a balneological and SPA resort. The combination of a specific climate and mineral waters is successfully used for treatment of arthritis, stress conditions, neurosis, chronic pharyngitis, bronchitis, asthma. The name of the resort comes from the colour of sand. The beach line here is 3.5 km long, and in some places its width reaches 100 meters. According to a local legend, pirates buried a golden treasure here, and in order to avenge them nature turned it into fine golden sand. There are multiple hotels in the resort, most of which are situated amidst broad-leaved forests. Their category varies, as well as their accommodation prices. Thousands of catering and entertainment establishments are scattered along the alleys of the entire resort. They offer the visitors diverse Bulgarian and international cuisine and multiple entertainment options. The resort is famous for its rich night life, the numerous clubs, discotheques and restaurants. The conditions for active rest are attractive both for families with children and for young people who seek entertainment. There is a rich variety of attractions for the youngest ones – an aqua park, various installations and slides for children, children sports centers, pony riding, and the animators in the entire complex take care of the well being and the security of children. Golden Sands is a resort which provides its guests with diverse sports options. Diving centers, tennis courts, volleyball fields, platforms for archery, a bowling hall, paintball, etc. are available here. For the admirers of water sports there are good conditions for yachting, water skiing, balloons rides, surfing, jet skiing and water parachuting. In the close proximity to the resort is the rock monastery – Aladzha Monastery, one of the most interesting landmarks on the Black Sea. There are also multiple landmarks in the nearby city of Varna, such as the Dolphinarium, the Archaeological Museum with oldest man-made gold treasure all over the world, the Aquarium, the Maritime Museum, etc.